Disabled Recreation Volunteers | DREAM Adaptive, Inc. Volunteers are the backbone DREAM! Over 125 volunteers generously donate their time to our programs and events throughout the year. Due to growing program demand, we are always in need of help! 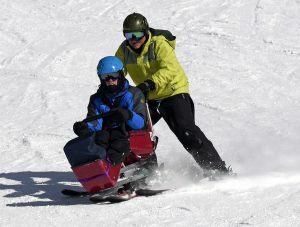 No previous adaptive sports experience is necessary! Volunteers receive special training to learn about the individuals we serve and about adaptive equipment we use to ensure a successful experience for everyone involved. We are currently seeking enthusiastic and dedicated volunteers age 16 and up to help with the 2018-2019 winter season beyond. See Application & Details section for more info! We have many non-sport related volunteer roles as well. I started skiing with DREAM in the 89-90 ski season because they needed people to load sit-skiers on the chair. I didn’t know how to downhill ski, so I would help load a skier and then snow plow back down the hill and help load another one. I learned to ski from DREAM volunteers and tried to keep up with them. Over the years as equipment got better, I had the opportunity to use the gear as it became available to us. Finding a need to help people without muscle control to access the mountain, we started to give bucket rides. I discovered that it gave me great pleasure in seeing the different individuals truly enjoying doing something they couldn’t do on their own – skiing fast and getting out with the other skiers. Over my 24 years of volunteering I’ve met so many truly wonderful people willing to give their time to help others and some have become good friends. From Randy who has MS and caught more air in the bi-ski than I’ve every done since, to my friend Daniel who wouldn’t quit skiing unless we took away his skis. 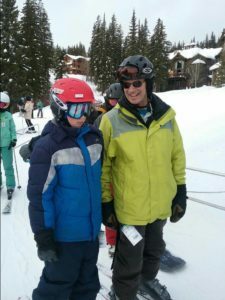 From the young man that had no arms and no legs that snowboarded the whole mountain with me to the young lady that stretched out her arms to fly as we pointed the bi-ski down Home Again – they all tug at my heart and give me great joy to see them succeed. Working with kids and adults in an active & spectacular environment is active & spectacular volunteering. Time spent out-of-doors in the slopes of our winter-wonderland mountain exercising mind and body is healthy for participants and volunteers alike. Relationships that develop with participants can be highly rewarding but naturally not without challenging moments. And having like-minded colleagues who are willing to take the risk of not always predictable work is also predictable rewarding. Thank You Randy, Bob, and the countless volunteers for your continued dedication to our programs and athletes!